Located in Fisherman's Wharf, the San Francisco Dungeon is one the city's latest tourist attractions. 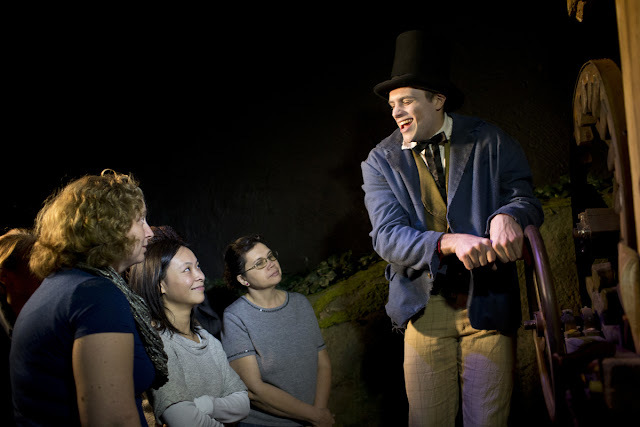 With a little over a year under its belt (The dungeon opened June 2014), this innovative walkthrough continues to vie for tourists' attention along with the numerous competitors nearby thirsty for business. It's run by the global Merlin Entertainment group, which manages tourist attractions and theme parks all over the world. The original concept started out in Europe, where Merlin opened numerous Dungeons throughout the region. 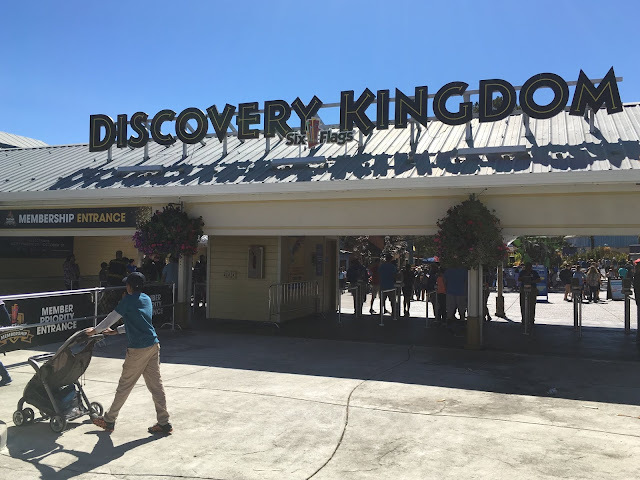 It finally made its way here to the United States, where it's currently the first and only attraction like it in North America. 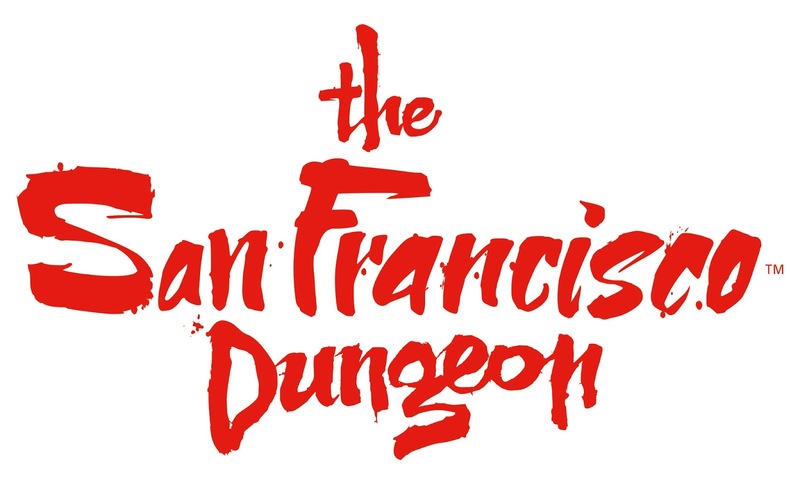 But, the question you might be wondering is...What exactly IS the San Francisco Dungeon? The simplest way to describe it is a walkthrough attraction and live stage show mixed together. The 60 minute long exhibit focuses on detailed story telling, immersive sets, and little "gags" and "quirks" mixed in along the way to create an unique experience for guests. The experience is broken down into nine parts, or nine "Live Actor Shows" as they describe it. Each "Show" is basically a new set and/or time period, with its own live actor reigning over it. Each part is stitched together to create one seamless experience about the history and legends of old San Francisco. 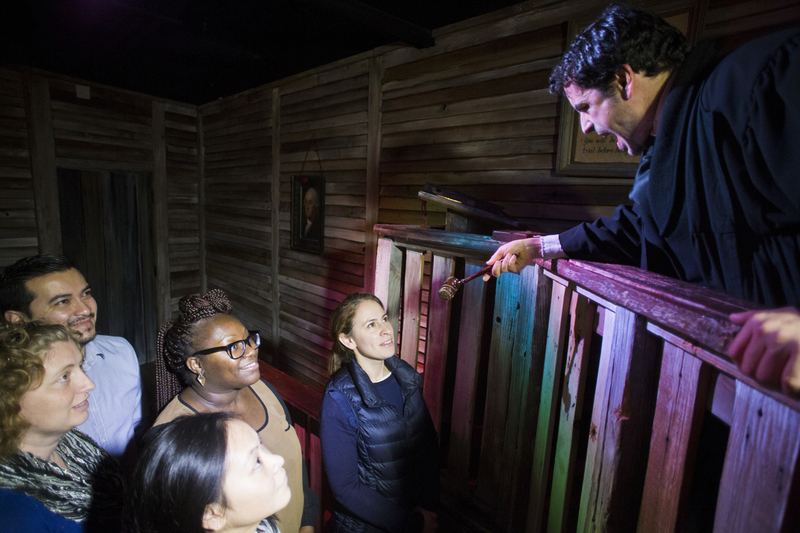 The attraction's intro features a simulated elevator ride that "lowers you down" into the depths of the dungeon. Our first location during the gold rush features an illusion of a projected face on a inanimate figure to speak of early SF. An unexpected mirror maze proves that sometimes basic tricks are the most fun, as our group had a great time forging our path through the large reflective puzzle. Don't worry about getting lost, as an actor will subtly help guide you to the next room if necessary. Everyone is "caught" and held against the wall for trespassing while walking down the streets of old SF. As seen extensively in the video above, you are brought to the courtroom of San Francisco for the crimes you are accused of committing. Audience participation in this scene adds additional laughs, as members of the group are prosecuted by the judge on stage for all to see. A personal favorite of mine, a wonderfully detailed saloon is the stage for Miss Piggott to speak of a murderer on the loose in the city. Be prepared for total darkness! Unfortunately, the physical boat ride system for this stop is currently down for maintenance. This part is therefore a little stale without the main ride system "gimmick" that the scene generally includes. Along with more audience participation, a doctor attempts to cure our group that's been infected with the Black Plague. Those weary of blood should keep their eyes closed for this one! The grand finale of the attraction ends with a bang, as we are all sent to prison in the cells of Alcatraz. I don't want to spoil the ending, but let's just say some spooky things happen here. Overall, I was impressed with this immersive attraction experience. The sets in particular are quite detailed, which helps sell the overall atmosphere and compliments the superb live actors. The only concern I see is not with the attraction itself, but the way it's marketed and promoted. For the average tourist being introduced to the attraction for the first time on Fisherman's Wharf, the Dungeon sells itself on being far more frightening and "haunted house-like" than it is. I went in expecting to be decently scared, and came out more on the entertained side. 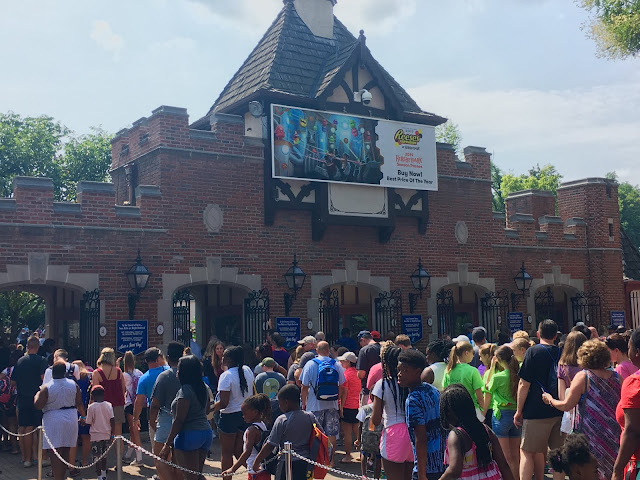 This is by no means a bad thing, and I believe an attraction that leans more on the entertaining side is actually more adequate for this market. But, the current marketing appears to shun away many groups that are expecting the gruesomeness and jump scares similar to a haunted house. 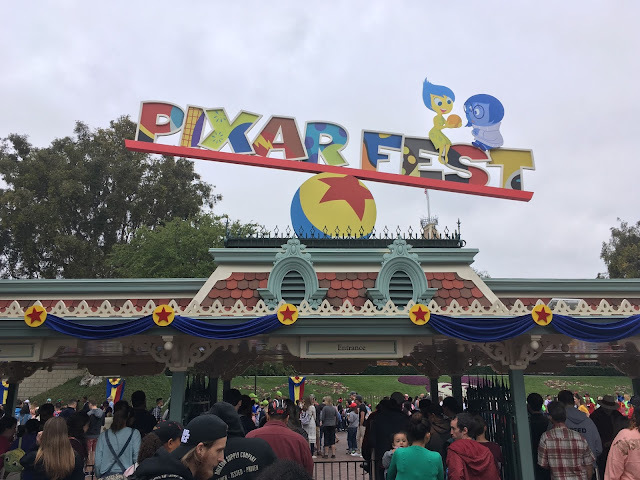 I believe a slight tweak into how the attraction is marketed will benefit attendance tremendously, as this was a truly entertaining experience. If you find yourself in the vicinity of San Francisco and are looking for a unique entertainment experience, I've found your place! That's all for now from Theme Park Overload. Make sure to "Like" our Facebook Page for Exclusive Content and Prize Giveaways! www.Facebook.com/ThemeParkOverload My name's Nicholous, and Thanks for Reading! Special Thanks to Beth with Spritz and the San Francisco Dungeon for accommodating Theme Park Overload during our visit!